Because when ya steal from the government, you’re stealing from yourself, ya dumb ox. 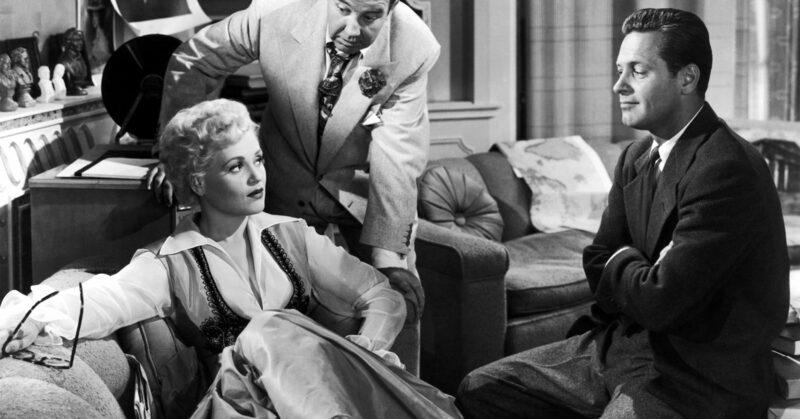 Judy Holliday made a huge impression on Katharine Hepburn in ADAMS’S RIB (1949), which led to her being cast in this comedy classic from 1950. Born Yesterday is sort of a PYGMALION (1938) tale where a man transforms a ditzy woman to an intelligent one. Directed by George Cukor, this film set the stage for him to later direct a similar story, the more well known MY FAIR LADY (1964). Coupled with a great screenplay, this movie is not to be missed. In BORN YESTERDAY, an unmannered business tycoon tutors his ex-mistress in order to buy himself some congressmen. His plan backfires when Billie Dawn (Holliday) becomes more educated and realizes that Harry Brock (Broderick Crawford) is nothing but a crook. The performance earned Judy Holliday an Academy Award for Best Actress. Trivia: The film was picketed by veterans in New York and New Jersey as Judy Holliday was investigated by the FBI for allegations of being a communist. She was advised to play dumb in a Senate hearing in 1952, and did so very well. Very much like in this film. Membership and tickets can be purchased at the door.